If you are in Beijing you might as well go and see a few theatre performances. The quality is not always the best but most of the shows are perfectly entertaining enough to waste a few hours. Many visitors know about haggling and that one should ever accept the first price. However not so many people know that this also applies to most of the theatre productions in the city. Some tour companies around the city offer discount tickets to these shows so you don’t even need to haggle! What you must understand is that this business is operated by tour guides and not by the official theatre ticket window. That’s why with companies like “May Tours” you must book the tickets in advance. To actually purchase your discount tickets all you need to do is go to the theatre before the show starts and a tour guide will be there waiting for you while holding your name. I can assure you that it’s perfectly safe to purchase from them as the business is conducted inside the theatre premises. In this post of mine, I will do a brief introduction to some of the shows where you can get a significant reduction in price! Here you can get a glimpse of the performing art of “Peking Opera”. This is the least popular which shows how little tourists are really interested in Chinese culture. One of the most important cultural events going on the city has to be Beijing Opera. This has hardly anything to do with western Opera but instead is a rather entertaining and even amusing art form you will most likely never see anywhere else. No worries, this place has made sure to not bore you because all the visitors will be tourists. They also have english subtitles so you can catch the story. Great for first timers but if you are anything more than a little experienced in Peking Opera, it is advised to go somewhere else. As for the acrobatics, it’s really top notch. The place is a bit old but has that originality in it’s attractive feel. Go there and enjoy with the whole family if your looking for an easy as well as an exiting time. The Beijing Red Theatre is pretty much the coolest place you can go. Well almost, the Kung Fu show hosted here is really famous and extremely well done. The story however is not that profound. Anyone a fan of action or martial arts will definitely enjoy here, but children as well as those that like theatre productions will be equally satisfied. 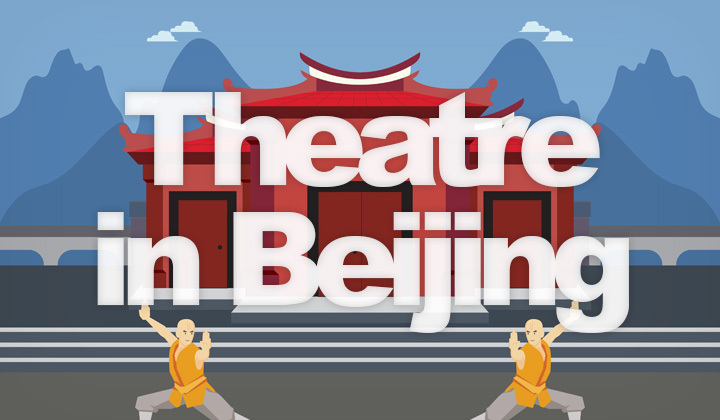 Have you been to a theatre in Beijing? Know how to get a discount? Just leave a comment below to share the goodness!